A baby crib is a smaller sleeping alternative to a cot for young babies from birth, up until around they're around six months old. The rocking motion from a swinging crib can help settle and calm babies - but, like Moses baskets, a crib is a purchase you'll get only limited use from. Weigh up the pros and cons before you buy. 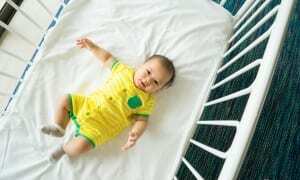 If, after reading the pros and cons below, you decide not to buy a baby crib, check out the Best Buy cot beds we've found in our rigorous lab testing. The main advantage of cot beds is that they last such a long time - they can be used as a cot from birth and as a junior bed as your child gets older. A crib's rocking motion can help some young babies to sleep. Can be used for longer than a Moses basket. Smaller than a cot, so more compact for placing in small bedrooms. A crib creates a cosier sleeping environment for smaller babies than a cot. Unlike a cot, can only be used for the first six months or so. Not portable like a Moses basket or carrycot. Not all babies enjoy being rocked. More expensive than a Moses basket. There are countless types and styles of baby crib available - from a basic rocking crib for around £50, to luxurious nursery centrepieces that run into hundreds of pounds. Many have attractive drapes that can be taken on and off - the drapes should always sit outside the inner crib where your baby lies. You might need to buy a separate drape rod. Most baby cribs can rock, and can be switched from a fixed to rocking position that gently sways to help your little one get off to sleep. You should not leave the baby crib unattended while it's set to rock. Avoid using an antique crib, as they won't meet appropriate safety standards and may be dangerous. There are countless pieces of baby bedding available to buy - but you don’t actually need that much to keep your baby comfortable when sleeping. We've got more in-depth advice on baby bedding you should stock up on before your little one arrives. Always properly secure a rocking crib when leaving it unattended. The crib mattress needs to fit snugly, with no gaps. Follow the assembly instructions to avoid putting it up wrong. There should be no cutout patterns in the head or footboard. 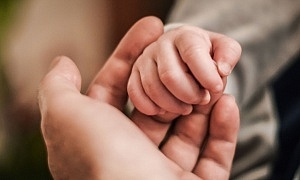 The recommended room temperature for a baby to sleep in is 16-20ºC, or 61-68ºF. Use a room thermometer to check the temperature before putting your baby to bed. The safest position for your baby to sleep is on their back, not on their front or side. Your baby should be positioned with their feet at the foot of the crib. Baby bedding should be tucked in and made up to come no higher than your baby's shoulders.